FRIEDRICHSHAFEN, Germany (BRAIN) — Hexlox has introduced a modular thru axle that allows retailers to reduce inventory by stocking three models that should fit most thru axle bikes, including standard, Boost and fat bike frames and forks. LAGUNA BEACH, Calif. (BRAIN) — Crankbrothers' new E-MTB-specific Lithium wheelset features twin-pair spoke technology with stronger 2.0 straight-gauge spokes, a "robust" steel freehub, and wide reinforced rim profile. RANCHO DOMINGUEZ, Calif. (BRAIN) — Ultracycle's Presta Adapter 2.0 is a lightweight aluminum valve adapter with a built-in tool to remove valve cores. It is available exclusively from KHS Bicycles. 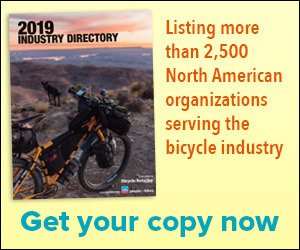 PARK CITY, Utah (BRAIN) — At the Eurobike show, POC released its 2019 cycling and mountain bike collections which includes the Omne Air SPIN road helmet, designed for road and urban use. FRIEDRICHSHAFEN, Germany (BRAIN) — At Eurobike earlier this month, French tire brand Hutchinson showed an internal wireless air pressure monitor, which will be available in the first quarter of 2019. INDIANAPOLIS (BRAIN) — Silca has released a direct-mount toptube bag, for use on bikes with toptube mounts. The Speed Capsule TT has a PE board base that helps provide rigidity to the pack, allowing the rider to more easily open and close the bag while riding, the company said. ASHEVILLE, N.C. (BRAIN) — Cane Creek Cycling Components has released a new suspension seatpost for dropbar bikes, called the eeSilk Post. The post offers 20 millimeters of vertical compliance, weighs less than 300 grams and retails for $289. SANTA CRUZ, Calif. (BRAIN) — Ibis Cycles has introduced new adjustable-width carbon mountain handlebars that can be run at 750 or 800 millimeters — or widths in between. MINNEAPOLIS (BRAIN) — Civia's new Parkway e-bike models, available in step-thru and step-over models, "are designed with the mission of helping more people get out into their own cities and towns with confidence and style," according to the brand. WATKINSVILLE, Ga. (BRAIN) — Tifosi Optics has released the Alliant, a new style of sunglass designed to be lightweight and rugged, with an obstructed clear field of vision. BEND, Ore. (BRAIN) — CushCore has added a version of its foam tire inserts — the Oregon company calls them an “inner-tire suspension system” — for 27.5-plus wheels. BURBANK, Calif. (BRAIN) — After launching its first e-bike, the Volta urban commuter, on Kickstarter last year, Pure Cycles is turning to crowdfunding again to bring its Capacita cargo e-bike to market via an Indiegogo campaign. VISTA, Calif. (BRAIN) — Wend Bike, which has offered a rub-on wax chain lube since 2015, has introduced it in six new Day-Glo colors in its Spectrum line. Wend's paraffin-based formula includes friction reducers including zinc and Teflon. ATLANTA (BRAIN) — Wahoo Fitness is launching an updated and expanded line of KICKR smart trainers at Eurobike. It's also adding a new fan, called the KICKR Headwind, that can adjust its power depending on the rider's simulated speed.